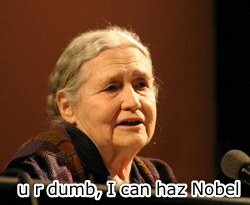 Newly awarded Nobel Prize winner Doris Lessing has used her acceptance speech to tell the world that the internet makes us dumb. According to Lessing, who was too old and ill to make the speech herself and instead had someone else read it out, the inanities of the internet have seduced a generation, and we live in a fragmenting culture where people read nothing and know nothing of the world. Whilst Lessing’s words should be taken somewhat in context: the ditherings of an ignorant old woman, Keensian (as in Andrew Keen) anti-internet speeches grow as the cultural elite in society continue to have their previous (often born-in-to) positions eroded. The likes of Andrew Keen and Doris Lessing ignore the many benefits the internet has provided in expanding access to knowledge to many, many more people than who may otherwise have had no access before. Whilst it may be easy to mock the utterances of hundreds of millions of bloggers and social networking site users, the 21st century will be remembered as the time that communication was democratized, a time where the power of a few was replaced by the power of many. Let them eat their elitist intellectual cake, because the world is changing for the better, and there is nothing they can do to stop this. The Guardian has the full text of Lessing’s speech here, which I note aside from the internet comments is a great, and often inspiring read.